In keeping with Lyle's philosophy that 1/25 scale car parts often work well as 1/12 scale motorcycle parts, he used a turned and polished aluminum air cleaner made by Chad Shapiro (several years ago). 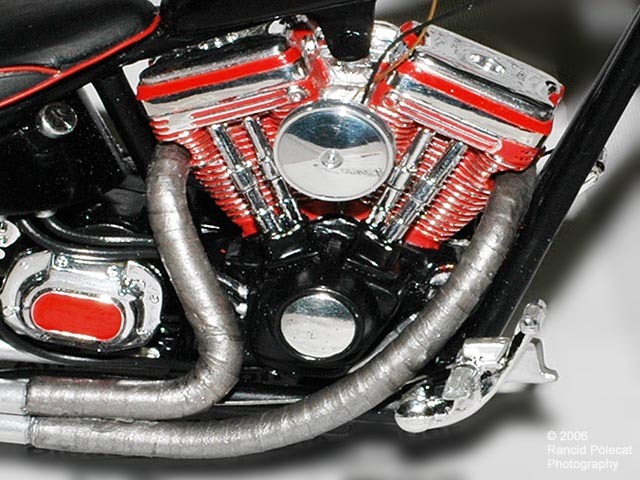 This hot rod air cleaner looks just as at home on this motorcycle engine as it would atop a 350 Chevy. To make those "heat wrapped" pipes look like the real deal, Lyle wrapped Tamiya 1/8th-inch masking tape on the pipes and painting the tape with a steel colored paint.